My book is designed to begin a journey. It’s a journey that ends with you being better online. This journey ends with more cred for you, more sales for your business and more sanity in general. Some of our more advanced articles are over on The Conversion Scientist blog. 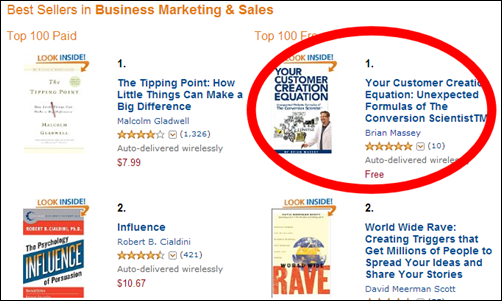 There are over 200 articles there covering all aspects of conversion-focused marketing. I’ve picked nine that I think you should read. And we’ve added an incentive to get you through these nine articles and make things a little fun. We even included several audio selections for your commute to work. Each time you read or listen, you will collect points. Collect enough points and earn a badge. Earn your Ph.D. in Conversion Awesomization, we’ll give you a special prize. We have nine articles organized into three levels of learning. You can earn four badges you can earn. The Student Badge is awarded when you sign up to start collecting points. You don’t want to stay at the Student level. It means you haven’t really done anything. The Undergrad Badge signifies that you’ve completed the basic level of content (basic for a Rocket Scientist, maybe). Copy that makes visitor stick. Six email superstitions holding you back. The four people who come to your site every day. The Master Badge signifies that you’ve completed the basic level of content (basic for a Rocket Scientist, maybe). Pushing past content marketing barriers. The Ph.D. Badge signifies that you’ve injected all nine articles into your ever-swelling brain and you qualify for a free site review with a Conversion Scientist. Creating landing pages that convert. Getting past the bouncers in our brains. Now is the time to start. You will get your Student Badge and 100 points just for signing up. Within a few days, you will be a Ph.D. in Conversion Awesomization. In the forty-five minutes or so of his presentation, he took us on a journey through the past eighty years. His sign-posts were pop music, literature and art. The journey showed how our culture evolved from a “We” generation to a “Me” generation and back. Then he said something that turned out to be prescient. If his pendulum theory was correct, he said, “2009 is going to look a lot like 1929.” We now know that, economically, 2009 looked a whole lot like 1929. This framework delivers actionable insights, but it’s also just interesting as hell. 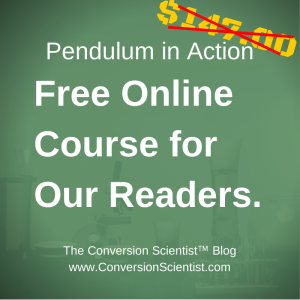 So, I was pleased to learn that Michael Drew, Roy’s co-author of the book Pendulum had put together a fundamentals course on the Pendulum for just $147. A fascinating course at the right price. But, for you, my readers, he’s offering it free of charge. This course is important because it helps you understand the shifting motivations of the people to whom you are advertising and marketing. Why do proven marketing programs stop working over time? It’s not necessarily list fatigue. Why do we have such trouble marketing to millennials and other emerging generations? It’s because they are riding the pendulum ahead of us. Can we just keep doing things the way we are? The Pendulum proves that you can’t and won’t. This stuff is fascinating and inspiring to me as a business owner and marketer. Let Michael show you how to apply the lessons of the Pendulum. You can have a brilliant product or service, but if it does not meet the values or the desires of a changing generation, you will struggle. Herein lies the basic ideas behind Pendulum. Pendulum gives you the tools you need to build your online network and motivate prospects to take action. Straight forward and simple to apply, Pendulum in Action will give you a competition-crushing advantage in your market. It’s an important macro shift and Michael has boiled down a system to take advantage of it. The Fundamentals program gives you a crystal ball of sorts. You’ll find yourself trying and succeeding with approaches you never would have considered without it. Who doesn’t want to see into the future? Applying Pendulum In Action is a way to set marketers and business owners apart from their competition. Don’t miss out on this opportunity to get insight from the best on buyer persona and relationship marketing. “Times change, but some things remain consistent: People either think of themselves or of others. The question is, how do you know when and what does it mean. 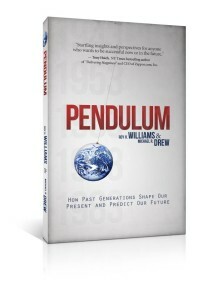 Williams and Drew have figured that out in Pendulum, their razor-sharp look at cultural shifts over the last 3,000 years. You need to know your customer. Pendulum gives you that knowledge.” – Jonathan Blum, SVP and Chief of Public Affairs and Global Nutrition Officer of YUM Brands. “For anyone in advertising or marketing, this book is a must. It will tell you why our communications have stopped working and what you need to do about it. 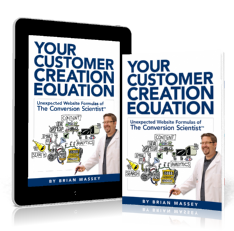 As with any good book, this one raises many questions as it delivers invaluable insights.” – Brian Massey, The Conversion Scientist and bestselling author of Your Customer Creation Equation. “Startling insights and perspectives for anyone who wants to be successful now or in the future”- Tony Hsieh, CEO Zappos and New York Times bestselling author of Delivering Happiness.